Yep, there’s a whole lotta new going on in the world of Resurrection Radio. For those of you who caught us in the late fall at either The Rook or Bolt Brewery, you may have noticed a badass guitarist and vocalist added to the mix. That badass is none other than Tim Campen, who officially joined the band this fall. Tim went to high school with Roc and Scott and has played in bands around San Diego pretty much since that time. We’ve had a mutual admiration society thing going on for a while, and when Tim’s last band went on an indefinite hiatus we were lucky enough to con him into joining us. If you’ve seen and heard Tim play you know that he adds a ton to what we’re doing, and makes us all better. Be sure to say hi at the next show. Speaking of the next show, we just confirmed our return to North County. 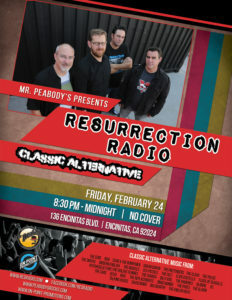 We’ll be playing at Mr. Peabody’s in Encinitas on Friday, February 24th. This classic North County venue is just off of the 5 freeway, one block west, so it’s easy to get to, and we’re stoked to be there. 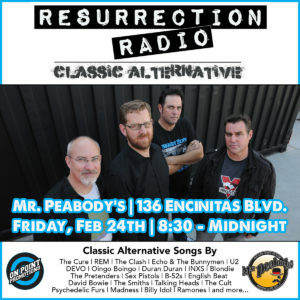 For those of you in North County, it’s a more convenient location for you, and for our regular San Diego and La Mesa friends, take a nice little drive north to kick off a Friday! We’re also working on a handful of new songs, and will be adding new material all year long. 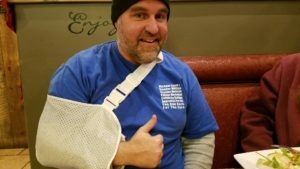 And despite Rob’s valiant battle with gravity, which left him in this fashionable sling for a couple weeks, we’re pressing on in learning new materials and refining some existing tunes. Thanks to everyone who’s come out to a show, danced like a maniac or cheered and supported us thus far. We love doing this and we’re looking forward to lots more in the years ahead.